Brian Benson is the nice guy every girl dreams of marrying. Too bad he’s off the market—for good. He’s sworn off women since the last girl he dated broke his heart. Determined to start over in New York, his sole focus is to climb the corporate ladder—no distractions. Until one minor collision propels him into the path of small-town-girl but bombshell babe, Kendy Miller. Kendy walks with a sass she was born with. Single and ready to mingle, she’s on the prowl. Moving from her tiny town of Bowlesville to work as a nurse at New York Cornell Hospital, she is introduced to Dr. Hot Pants. She feels it in her bones—he only belongs to her. When Kendy formulates a grand scheme to land Dr. Hot Pants and uses Brian to do it, Brian is all in because he could use a little fun. Things were going to plan, until one night lines were crossed, kisses were exchanged and clothes flew off. Fate collides, fortunes are tested and plans backfire, but Kendy is still determined to land her doctor. Problem is… Brian was only there to assist in the plot. 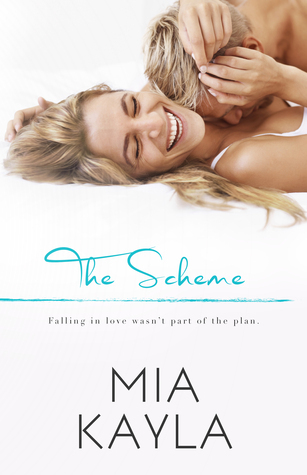 Falling in love with the girl wasn’t part of THE SCHEME. I loved this book!! It was incredibly written. Kendy is a nurse at a local hospital who has her heart set on landing Dr. Hot Pants. He doesn't seem to notice her tho. Then Brian an acquaintance from the past shows up in her ER and a weird sort of friendship blossoms... She figures if Dr. Hot Pants sees her with Brian it will spark his interest and she will finally land him. Brian and Kendy start spending a lot of time together and rules get broken and feelings get hurt, and Dr Hot pants finally notices Kendy. She finally got what she wanted but is it still what she wants???? I highly recommend this book. I loved every minute of it. I loved Brian and I loved Kendy. I will definitely be reading more by Mia!